Product prices and availability are accurate as of 2019-04-19 05:19:00 BST and are subject to change. Any price and availability information displayed on http://www.amazon.com/ at the time of purchase will apply to the purchase of this product. 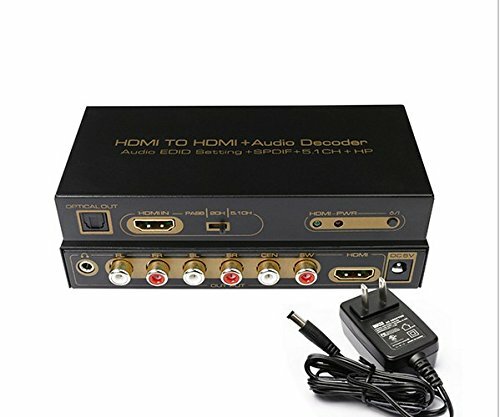 The HDMI TO HDMI Audio Decoder permits you to extract audio signals from your HDMI source. You can take your initial HDMI audio signal and convert it to digital optical or analog 5.1 noise track output. This devices supports Dolby digital AC-3, DTS, LPCM and other digital audio format decoding. 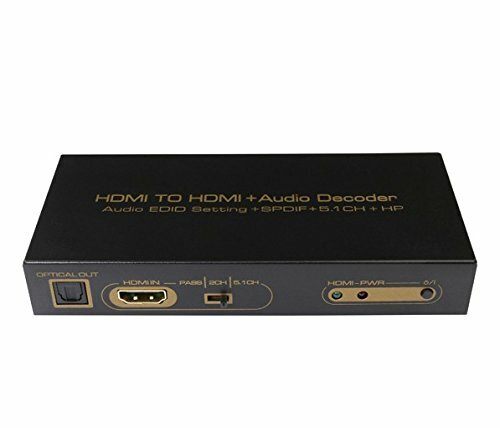 It is one best audio decoder for your DVD, Blue-Ray DVD, PS3, X360BOX, HD Player, COMPUTER etc. HDMI resolution: up to 1080P/50/60fs (3D 24/30fs). Support video color format: 24bit/deep color 30bit,36 bit. HDMI Audio Format: DTS-HD/Dolby-TrueHD/LPCM 2/5.1/ 7.1 CH/DTS/Dolby-AC 3/DSD. Digital audio decode format: Dolby Digital (AC3)/ DTS/LPCM 2CH. HDMI Max baud rate: 6.75 Gbps. Input/Output TMDS signal: 0.5 ~ 1.5 Volts p-p(TTL). Input/Output DDC signal: 5Volts p-p (TTL). DSP sample frequency range: 32 ~ 96 KHz. DSP Bit rate range: 16 ~ 24 Bit. Analog output level(1kHz@0dB): 1V RMS. SNR @ 0dB(CCIR/ARM): â‰¥ 85dB. Headphone output power (1kHz@0dB RL=32): 20mW. HDMI input cable range: â‰¤ 15m AWG26 HDMI conventional cable. HDMI output cable range: â‰¤ 18m AWG26 HDMI conventional cable. Power adapter format Input: A/C 100V ~ 240V 50HZ/60Hz, DC5V/1A. 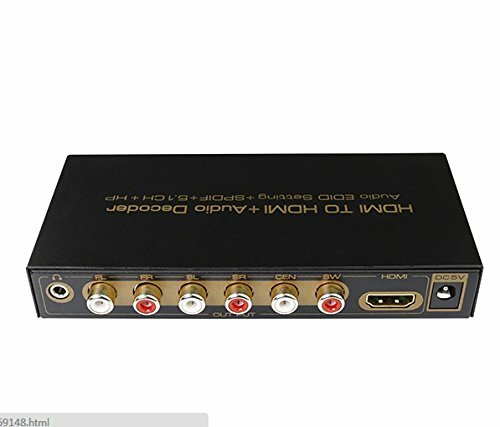 1 x HDMI TO HDMI + Audio Decoder. 1 x A/C power adapter. Supports 3 modes of EDID management for audio formats, can switch among built-in EDID (2CH/5.1CH) and external EDID (TV) Uses 24 bit/96KHz audio DSP and 24bit /192KHz DAC Support digital audio formats: Dolby digital (AC3), DTS, LPCM, automatic identification signal format Support HDMI input up to 1080P/60Hz, supports 3D (24/30fs) 1x HDMI input and 1X HDMI output ,can sync separation HDMI audio signal. 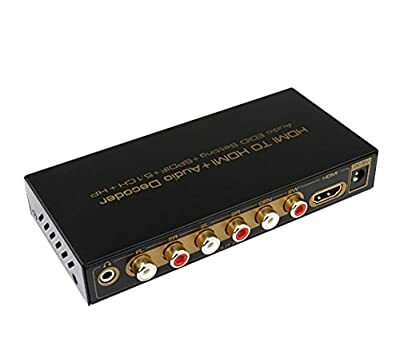 Supports 1x SPDIF optical digital audio output, 6 channel RCA analog audio output, and 1x headphone jack output.